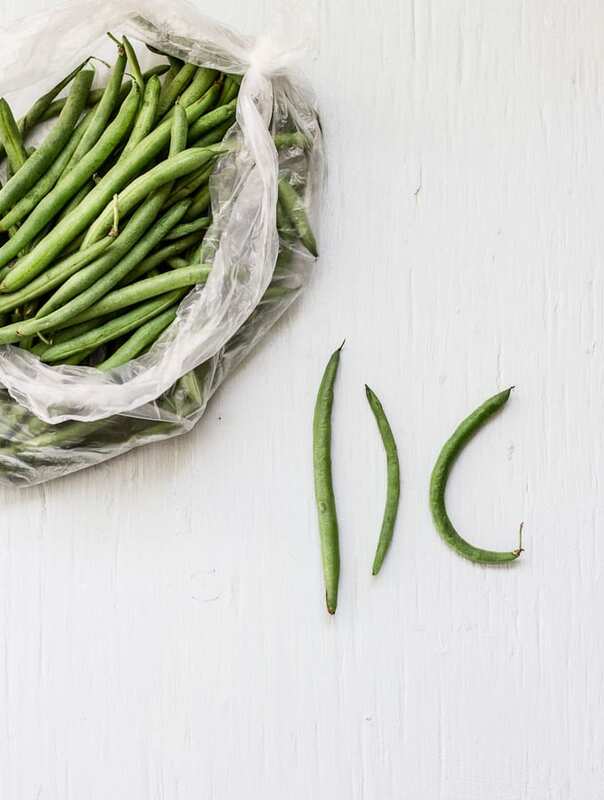 Ever wonder how to French-cut green beans? The problem is they’re not all the same size. Some green beans are straight, some curvy, and then you get the odd bent one (or two). I’ve never been able to achieve good results by hand. The end result is a big pile of uneven, funky looking beans. I loose sleep over stuff like this. Eventually, I got my hands on an actual green bean cutter. Clearly not a popular item; it was on a bottom shelf about 1 inch off the floor covered in dust. I bought it anyway (only $3!). It would be the perfect solution to my problem. The package said so. Simply pull the beans through the blades and you will receive gorgeous, thinly sliced strands. It works! You have to do it one-by-one and after about 10 of them, the novelty wears off. Because you have 50 more to go. You get distracted. You discover your child flushing play-doh (mock poo) down the toilet. You realize that this obsession of yours is a complete WASTE OF TIME and no one in their right mind wants to slice green beans by hand. I lose even more sleep. Didn’t I just use this method to slice a whole mass of veg. for lentil soup? The secret is the slicer blade. To begin, cut the green beans to fit the mouth of your feed tube. Stack the beans horizontally (not sticking straight up) and gently press them through. In less than 5 seconds your job is done. French-cut success! I like mine sauteed with butter and shallots. Try this method and you’ll see that it works. No more struggle. No more canned or frozen beans. No more drooling over glossy magazines. It’s an incredible timesaver that transforms ordinary to extraordinary. This is how to French-cut green beans like a pro! Green bean casserole anyone? Now go on with your bad self. Seriously, what a great post! I love discovering little helpful tricks like this! It saves so much time! Thank you! I never knew how handy the food processor was until I started experimenting with all of its functions. It is a HUGE timesaver! I use the slicer blade for many things including vegetable soup. At least you can throw it in the dishwasher once you’re done too (who likes to clean that thing anyways?). Enjoy! Have you ever tried to slice Okra? I hate slicing Okra’s. Hi there! I know what you mean about okra ;) Unfortunately, I haven’t tried slicing it this way. Keep me posted if you try it! How do you freeze them? Blanche before cutting or afterwards? Brilliant! I can’t wait to try your method. Frankly I had forgotten how much I used to love French Cut beans. Ah perfect! You’re a genius! Great tip. Makes me want to sautee a bunch with butter (yes butter!) and slivered almonds. A little himalayan salt and pepper to finish. Love the photo with the funky shapes. I’m not usually a fan of green beans, but if I am subjected to them, french cut is the way to go! Thanks for the tip! Maybe I’ll turn over a new leaf and give them another try!! Yes! Do it! You’ll be amazed at how fast the food processor works and I’m telling you, they taste different. Nice and thin, minimal squeak ;) Thanks Laura! I was just telling a friend of mine how i liked french style green beans more then regular green beans and she said ‘you mean out of the can. that’s gross.’ Now I can make them fresh and make her eat them and tell her they are all natural! Thank you so much! Score one for me! Hi Janette! I know exactly what you mean. This is so, so easy and way better than the mushy green beans from the can. Plus you get fresh green beans with all of the health benefits. Happy to know that you stumbled upon this- cheers! You are a life and marriage saver!! I just harvested a load of beans from the garden. My extremely picky husband will ONLY eat French cut green beans! I used to think he was nuts, but after reading your post I feel that I understand his pain a bit more, lol! I was mentally preparing myself for the chore of hand julienning all those beans when I thought maybe a google search was in order. Thank you so so so much for this post!!! Hubby will be so happy, and so will I! It’s mentioned after the 2nd to last photograph. Use the slicer blade ;) PS- it’s the slicer disc, if that helps. 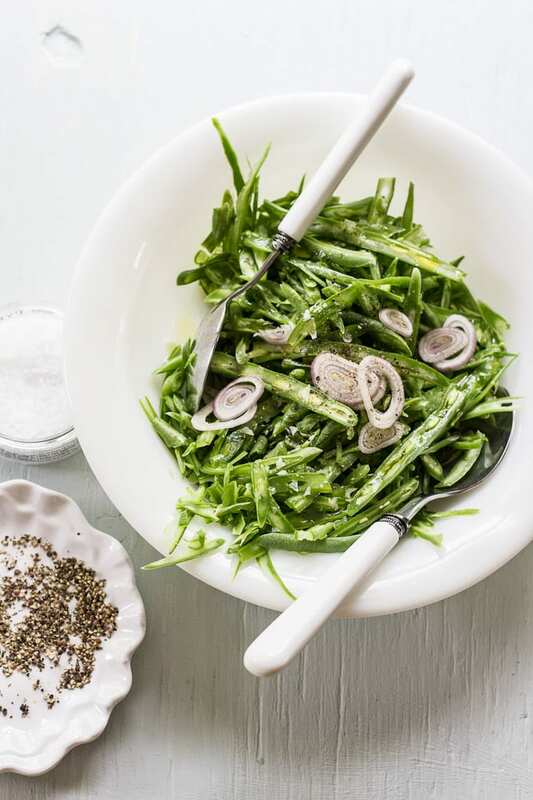 My friend Margi gave me a green bean recipe to make for her party—French cut—what is that? Thank God for your obsessions on the green bean! which slicer blade? I have them in 4 ‘thicknesses’ 1 mm, 2mm, 3mm, and 4 mm. This is so old school fabulous, thin-cut green beans are straight outta my childhood! Though Mom always used frozen Bird’s Eye brand or whatever the grocery had. So funny I was thinking about these just the other day and asked my wife, hey remember those thin sliced green beans everybody ate as a kid? She said you mean the ones cut into inch-long bites? I said no, the ones sliced super thin the long way like green bean zoodles…she looked at me like I’m nuts and said she’s never heard of such a thing. 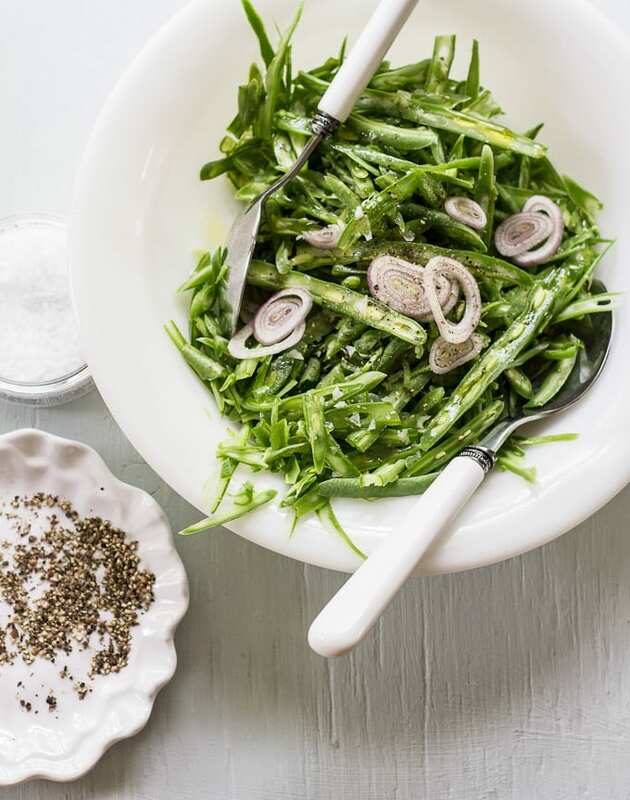 Well I’m making these tonight and she’ll finally know the magic of the French Cut Green Bean! So how wide is your feed tube? Your beans look long….. my tube is only 2″wide at the most…..is it an optical illusion? Are your beans just 2″? If they are that’s ok but yours look longer. I have 8 people coming for dinner tomorrow and I think I will do a trial run today. Ok….I have figured it out, with the safety mechanism that has to be taken apart between “batches” in order to access the large tube…. it is irritating but still better than doing it all by hand! Can I freeze French cut green beans? I’ve never had luck with freezing French cut green beans- they were always too soggy. However, maybe you’ll have bette ruck than me- blanch quickly in boiling water (they should still be crunchy) and shock in ice cold water. Pat dry and freeze ziploc bags. That was SUPER HELPFUL. My mother-in-law is coming over for dinner, and she really likes french-cut green beans. But I was kind of at a loss as to how to approach this, and rather reluctant to try to halve them, and then halve them lengthwise, which seemed . . . tedious at best, if you’re serving 5 people who eat a lot of veggies! 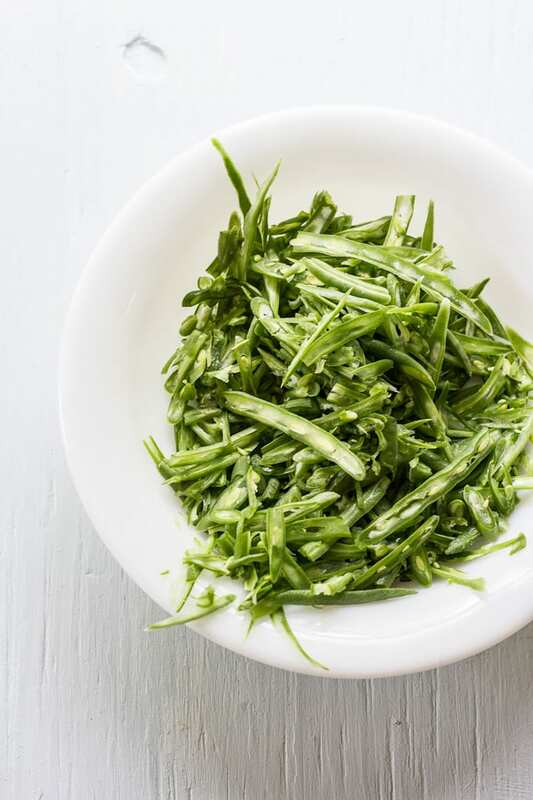 Do you blanche the green beans prior to slicing? Hi Debra! No, I slice the green beans raw. They would be too soft for the food processor otherwise. You can blanch them afterwards. What if you only have a mini-chopper. Just cut them in half or thirds and lay sideways? If your mini chopper has a slicing blade attachment then it might work. But if it just comes with the regular blade, then it won’t produce the same results. Thank you! I was just wondering if I could French my green beans this way. Now I’ll not waste my money on a hand-crank frencher. I could kiss you. Really. 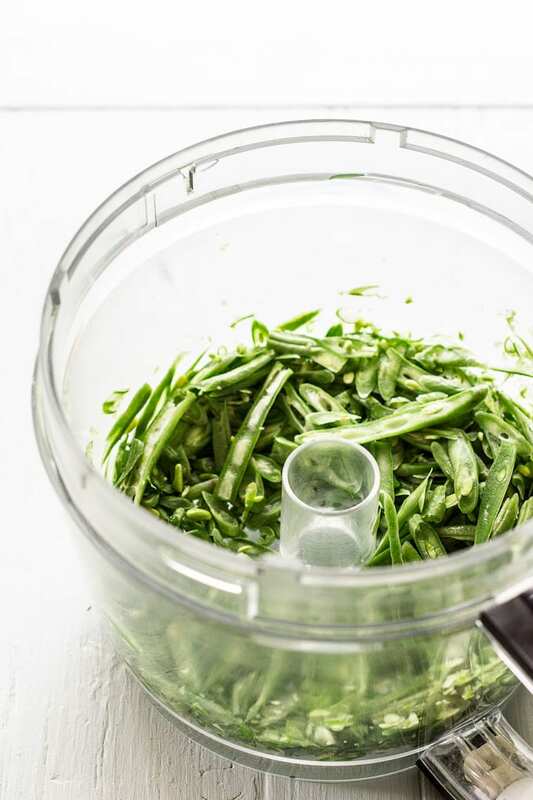 I NEVER would have thought of using the food processor for French Cut Green Beans which I always preferred but for some reason can no longer find in the frozen vegetables any more. It’s like they’ve disappeared from the earth. I went right out to Aldi’s and bought their package of green beans cut them in half (the chute in my food processor required it) and I was thrilled. Just a quick tip for anyone reading this, I found it easier to fill the chute with the beans horizontally and use the pulse feature for a few seconds till the beans were about 1/3 down the chute, then add some more pulse 1/3, repeat fill, etc. At first I did the whole chute and it was a little hard to keep ending up straightening the beans at the bottom as I filled it..as some ended up vertically no matter how careful I was. By doing it in little “pulses” it was easy to add the 1/3 at the top horizontally. Thanks so much Emilie. I had never heard of your site and I love how you write (and think). I laughed out loud! Hello Nancy! Thank you for this comment. You made me laugh! I’m happy to hear that this tip worked out for you (and your feedback is ace, too!). Enjoy! I cannot believe it could be so easy. I have tried so hard to cut the green bean just so perfectly to end up with a mess! Thanks for the tip. And yes, I do lose sleep over such things. Hi Ava! Isn’t it a fun tip? Thanks so much for your feedback! I’d been searching all afternoon for a bean slicer on the internet and none looked any good. I came across this tip and instantly the problem was solved. Such a brilliant idea. Thanks very much. Where did you get your silverware? White handled flatware photographs beautifully..
Wow! This was a genius tip! I make egg rolls and use green beans as part of the filling. You saved me tons of time! Gracias!